What an excellent idea it was to venture out on Labor Day weekend with the Bay Bridge closed to go and check out wineries! Apparently about a million other people had this bright idea too, and we all got to know each while sitting in long lines of traffic. Yay! Every winery and restaurant we encountered in wine country appeared to be at full capacity--even the dinner scene in Santa Rosa provided more excitement than we'd hoped for. Luckily we stumbled on a couple of great places. My idea was to center our trip around a brewery and hit some wineries around it, then grab some chow and a nice local beer. I chose the Russian River Brewing Company in Santa Rosa because of its reputation, though I'm sad to say we never got a chance to try the beer, but I'll get to that later. So thanks to the crowds of wine-tasting tourists who helped us find some awesome places we might not have found otherwise, by forcing us to abandon our plans. And if you're skimming for the highlights, I always save the best for last--in this case, the Harvest Moon Winery. Since we were already in the area and I’m already a fan of Hook and Ladder, I wanted to try DeLoach. 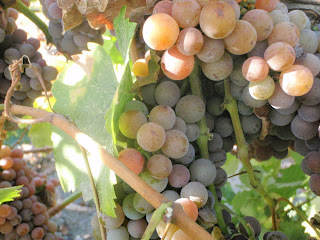 Both vineyards were founded by Cecil DeLoach, a San Francisco firefighter who later became a winemaker. In 2003 the vineyard was purchased by French winemaker Jean-Charles Boisset, who operates the family-run winery using eco-friendly practices. They were also extremely busy when we showed up, with what was probably their last late afternoon rush, and that included the people who left their two kids and a dog in the car while they enjoyed a nice sampling. It was either going to be some excellent wine or a tasting room filled with people completely lacking good judgment. Despite being filled to capacity, we met a warmer welcome at DeLoach than at our previous stop. Instead of completely ignoring us the busy folks pouring wine actually greeted us and ushered over to a side table. Yep, they actually made room for us. 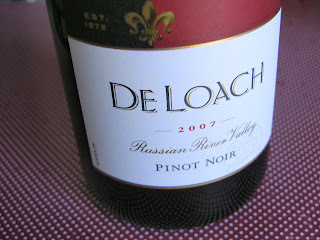 We tasted some great wines, most notably the 2007 Russian River Valley Pinot Noir. Because we bought some wine, or because they were really nice, the tasting fee was waived. 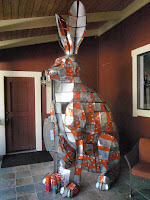 My favorite part of the winery: the giant bunny rabbit sculpture sitting outside that was made from boxed wine cartons. They scored major points with that one. We stopped at Harvest Moon because we were short on time and wanted to take in one more tasting before we hit the brewery. It was convenient and on the same road, and it turned out to be our favorite of all the wineries we've had a chance to visit. Let me tell you why I was so impressed. First, they had a resident dog, which I know has nothing to do with our topic, but it makes a good first impression. Next, the tasting staff was friendly and had a good sense of humor and the winemaker, Randy, was behind the bar chatting, pouring, and answering questions. He was young, probably in his mid-thirties, and full of enthusiasm. 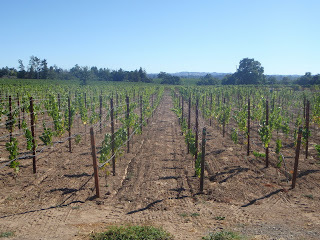 The wines were fantastic, and being a huge Zinfandel fan, I was pleased by their wines favoring that varietal. I was also impressed by Randy the winemaker's interest not just in the craft of wine making, but in growing the grapes as well. Needless to say I was sold. Beta Wife and I signed up for their wine club and are eagerly waiting to pick up our first two bottles next month. 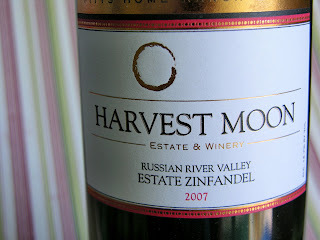 After getting home, I did a little research on Harvest Moon Winery and discovered that they have quite a cult following; it's not hard to see why. Of all the wineries I've ever visited, this one had the youngest and most enthusiastic staff I've ever seen, and that passion is infectious. In short, they are awesome. But don't expect to find them in stores—when these folks say small batches, they're serious. You'll just have to go to the source to your fix. Alas, we waited and waited for service in the Russian River Brewing Co., but it never came. I was disappointed because I had heard such praise—not just for their beer, but also their pizza. At some point they'll get a second chance. So instead we backtracked to the Puerto Rican restaurant we'd passed on the walk into town. El Coqui served some mighty fine food and had a few decent beers on tap. They're a new restaurant, still working out some problems, no doubt, but the chow was delicious and I plan on going back again. Recommends: empanadas and fried plantains for appetizers—Cuban sandwich, and thinly sliced steak with beans and rice for mains. You will either love or hate the bad dance videos they pipe in on the TV behind the bar at El Coqui, reminding you that the Macarena existed and that Gloria Estefan had giant 80's hair. WOW! Thanks Alpha Cook for your kind and quite humbling comments about our gig. We're glad you stopped by and checked out a winery with which you were unfamiliar! Hopefully, we'll see you two for one of our upcoming events. Cheers to a great 2010!